Sound: Excellent stereo studio recording. Comments: Great cd with 5 demo recording from the beginning... Really nice and interested. The songs are slightly different to album versions. Except of 'The Night Comes Down' which was used on the debut album, in a bit better sound. A must in a Queen collection. Recorded in late 1971 at the De Lane Lea Studios, Dean Street, Soho (Londen). The first 60 copies were sold with small typo's in the Liner notes. The rest of the 1.000 copies got corrected liner notes. How to recognize a copy with typo's is to look at the liner note's first sentence. If the first sentence starts without a capital "A" then you have one of the first 60 copies. 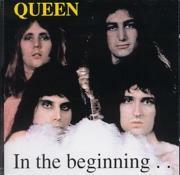 In 2011, Queen Production re-released all the studio albums in ordinary packing. But also deluxe versions was released with bonus cd. 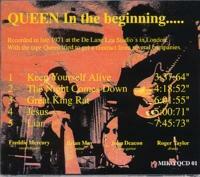 The first Queen I bonus cd included this 5 demos. Roots: Original bootleg. Previously un-released on the marked until 2011.